Oil separation, the extraction of oil from seeds or plant parts, is accomplished by mechanical pressing, sometimes followed by chemical extraction. 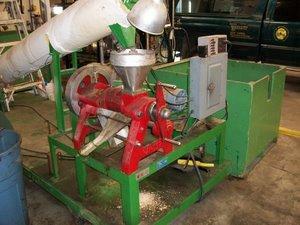 Mechanical pressing alone does not remove all the oil from the seed. Chemical extraction uses a solvent to remove the remaining oil that mechanical press cannot. Chemical, mechanical, and solvent extraction are terms accepted and understood by the industry. Small biodiesel businesses will likely extract oil from seeds using a mechanical method – a press that squeezes the oil out – rather than a chemical method, which is expensive and complicated. Mechanical extraction of the oil is accomplished by exerting sufficient force on confined seed. Under this condition pressure is high enough to rupture the cells and force oil from the seed to “escape.” Extraction is accomplished by compressing the material in a container that has small perforations, either round or slotted, that allow the liquid component to leave. This operation may be done in either a batch process or a continuous process. A batch process involves extracting the oil from one batch of seeds completely, before cleaning out the container and starting over. In this operation, the seeds are placed into a container with a moveable surface, most often the top. Then hydraulic pressure is applied to this moveable surface, which compresses the material, forcing the liquid component of the material to escape, usually through a perforated section in the bottom. In some cases, screw pressure was used instead of hydraulic pressure, as this was inexpensive and could be worked by people or animals. An advantage of a batch operation is that after maximum pressure is reached, it can be maintained for a short period of time, permitting the last bit of oil to flow through the medium and out the escape perforations. The disadvantage is that the container has to be completely cleaned out before the process can be started again. With a continuous process, the seeds are continuously fed into the machine. As long as the machine is on, it continues to press oil out of the seeds. In the past, the batch process was more common, whereas today in the United States, almost all facilities use a continuous process. However, in some parts of the world, the batch process is still used. 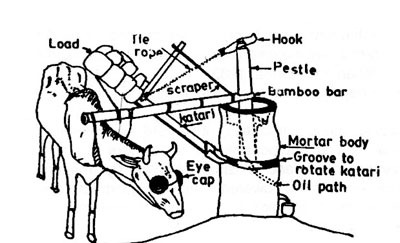 Animal-driven oil expeller used in Bangladesh. Drawing by Dev Shrestha. Today the expeller press is universally used for the continuous mechanical extraction of oil regardless of the size of the operation. 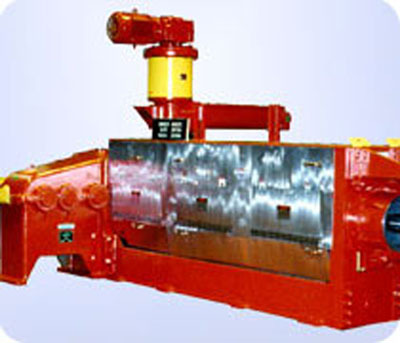 Expeller presses range in capacity from less than 1 ton to over 50 tons per day. The mechanical expeller press has six elements: the main worm shaft and worm, cage bars, drainage barrel, choke mechanism, motor transmission and bearings, and the loading system. These elements are designed to exceed a pressure of 137 MPa (megapascal) on the seed and should reduce the oil content to as little as 10% in the processed meal. Power requirements are approximately 1.5 to 2 kilowatts per ton of daily capacity. Perhaps more important than the power requirement is the energy requirement. For small-scale cold presses, this is generally 80 kWhr/ton versus 470 kWhr/ton for larger operations. Typically, seeds are heated for 15 to 20 minutes prior to pressing. It is important to keep in mind that for oil stability (to prevent oxidation) and to minimize gum saturation in the oil (from phosphorus), it is best to keep the oil temperature below 104°F (40°C). Higher temperature gives better oil yield, but higher temperature also results in shorter shelf life of the oil. So a compromise is needed. Extraction efficiencies are largely dependent on seed type, pretreatment of the seed, temperature, and press configuration. An extraction efficiency of 80% is considered very good. Most large commercial operations use a mild pressing operation to extract 60 to 70% of the oil, while the remainder is solvent-extracted. The advantages of pure mechanical extraction are lower initial investment costs, higher-value edible oil and meal, and a safer and less complex operation. The disadvantages are high power requirements, wear and tear on the equipment that requires maintenance, and lower yield due to residual oil in the meal. Here is a photo of the new Type 52 Hander/CeCoCo 1 ton oil press used at the University of Idaho’s Biodiesel Education Program laboratory, along with a diagram of its working parts. 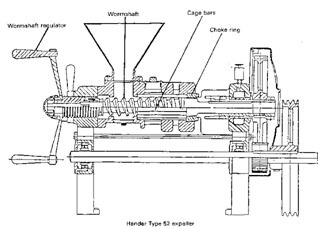 Operationally heated seed is fed into the barrel and transferred the length of the press to the choke, where pressure is built up, forcing the seed against the cage bars. The expelled oil flows down through small slots or holes in the cage bars and is collected, while the remainder of the seed or cake squeezes past the choke and is transferred to storage. Some seeds require additional preparation beyond cleaning. Soybeans, for example, are de-hulled, heated, cracked or flaked, and sometimes extruded before entering the press. Equipment used for these types of operations can generally be obtained from most press manufacturers. A producer should identify the oilseeds that they are likely to process in order to determine exactly what equipment will be needed. Commercial-sized press with interrupted screw design. Photo courtesy of the French Oil Mill Machinery Company. Smaller presses generally have a solid worm screw, whereas most commercial-sized presses use an interrupted screw design. With this type of design, the flighting of the main screw has gaps in it that allow for inconsistencies in seed quality or feed rate. This provides a more even cake and produces higher extraction efficiencies. Before you shop for a press, have in mind how much feedstock you plan to process per year, and how many days you plan to run your press. The per-day capacity of a press refers to how much that press can process in 24 hours. A press that can process 6 tons per day will have to be run 24 hours in order to process that 6 tons. Those who prefer not to stay up all night may want to adjust the capacity of the press. Small producers will be interested in a press that can process from 1 to 25 or more tons per day. Some presses produce a pelleted cake, while others produce a flaked cake. This may be important depending on how the cake is to be handled and used. What kind of feedstock can the machine handle? How many tons can be processed before the machine will need maintenance? The lowest cost crushing equipment is made in China or India, and importers are becoming easier to find. Several European manufacturers offer very good equipment for sale. Most U.S. manufacturers specialize in large, commercial-scale equipment, or in food-grade equipment. Each company offers different equipment with different features, and several offer a range of sizes and models. In general, prices are increasing with the rising price of steel and energy, and this trend will likely continue into the future. The equipment brand names and companies listed here are for information purposes only. No endorsement is intended, nor discrimination against products or companies not mentioned. Please do your own research before you invest in any equipment. Oilseed Processing for Small-Scale Producers. This article from the National Sustainable Agriculture Information Service contains detailed information about oil extraction and processing for biodiesel and food uses. It includes a list of oilseed press manufacturers. Small Scale Oilseed Processing. A brief overview from Montana State University. Discusses costs, processor capacity, and equipment manufacturers. Equipment for Decentralised Cold Pressing of Oilseeds. A paper from the Folkecenter for Renewable Energy in Denmark.